According to a December 5 news release from the University of Arizona (UA), an international team of astronomers has discovered the most remotely orbiting planet found to date around a single, sun-like star. 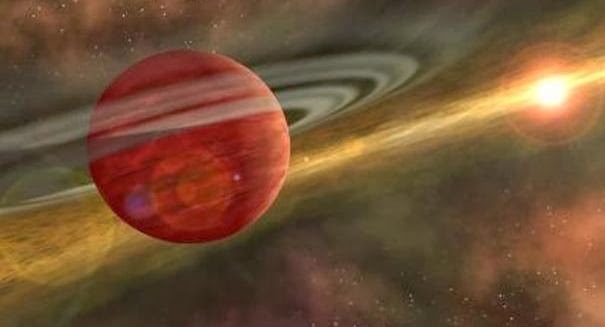 HD 106906 b — the first exoplanet to be discovered by the UA — is 11 times Jupiter’s mass and orbits its parent star at 650 times the average Earth-Sun distance, making the celestial body unlike anything in our own Solar System. “This system is especially fascinating because no model of either planet or star formation fully explains what we see,” said Vanessa Bailey, a fifth-year graduate student in the UA’s Department of Astronomy and lead researcher on the study, in a statement. Scientists think that planets close to their stars, such as Earth, amalgamate from small asteroid-like bodies born in the primordial disk of dust and gas that surrounds a forming star. Still, this process acts too sluggishly to grow giant planets far from their star. An additional proposed mechanism is that giant planets can form from a fast, direct collapse of disk material. Yet, primordial disks seldom contain sufficient mass in their outer reaches to allow a planet like HD 106906 b to form. Numerous alternate hypotheses have been put forward, including formation like a mini binary star system. Bailey said that one problem with this picture is that the mass ratio of the two stars in a binary system is normally no more than 10:1. This system is of specific interest as researchers can still identify the vestigial “debris disk” of material left over from planet and star formation. “Systems like this one, where we have additional information about the environment in which the planet resides, have the potential to help us disentangle the various formation models,” Bailey said.